Since 1973, Captain Black Little Cigars has been a name synonymous with flavor and class in aromatic cigars. With their pleasant taste, affordable price, and stylish appearance, Captain Black Little Cigars are a great way to kick back and relax, without the time-consuming, messy, and inconvenient difficulty of smoking a full-sized cigar. However, Captain Black Little Cigars are still cigars, with the same premium, tobacco-infused wrapper adding a delectable spice to the sweet flavor of the smoke itself. Available in 20 or 100 packs, and a variety of flavors, a smoke with Captain Black's is a smoke well-chosen. Captain Black's come in a variety of flavors, from the mellow and mild to powerfully intense. Captain Black sweets are perfect for those who prefer a subtler tobacco, with an intoxicating sweetness to take the edge off. Those who prefer more organic sweet flavors will enjoy the flavored tips of Captain Black vanilla little cigars, or the relaxing daiquiri like flavor of our peach rum little cigars. Meanwhile, for a smooth, mellow, and extremely relaxing smoke, nothing can quite beat the tailored flavor, light smoke, and luxurious aroma of Captain Black Sweet Cherry cigars. For any smoker of flavored cigars, Captain Black has a blend for you. Of course, that's just the Captain Black flavored options. Menthol smokers will love the crisp taste and distinctive flavor of Captain Black Menthols. Menthols are also great for less experienced smokers, who can enjoy the throat-soothing, minty effects of pure menthol. For sophisticates looking for a unique smoke, Captain Black Filtered Little Cigars provide an entirely different way of enjoying cigar tobacco and wrapper. 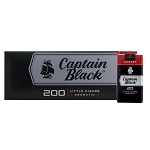 Of course, sometimes you just want the classic look and feel of a Captain Black Dark--our premium blend, Darks consist of expertly rolled and blended Perique and Cavendish tobacco, packaged in a distinctive, eye-catching black wrapper. For the tobacco connoisseur, nothing quite matches the sophistication or flavor of a Captain Black Dark. Sail away with Captain Black, and enjoy our 40 year tradition of great cigars at great prices. Whether you're buying for flavor, convenience, or simple cool factor, nothing can quite compete with the tailored taste of a Captain Black Little Cigar.